Explore MoreVIDEO: Myth or reality? Get a closer look at the White River Monster. , VIDEO: Ranked #9 in Top 10 Scariest Moments from Lost Tapes. , ON TV: Check the Lost Tapes Episode Guide for air dates. 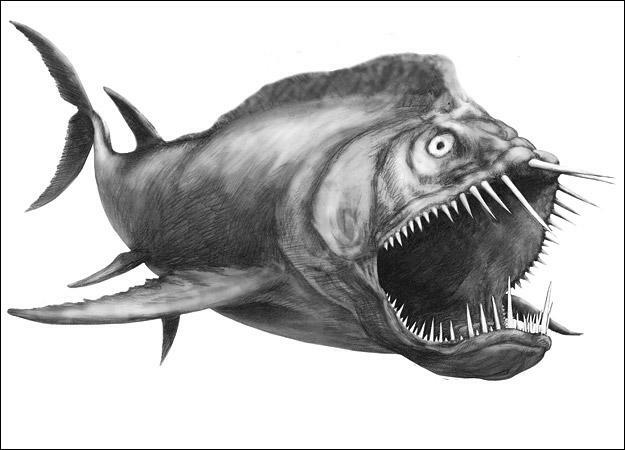 , TOP 10: Count down the Top 10 Scariest Sea Monsters. EARLY SIGHTINGS: The legend of the White River Monster begins in the town of Newport in northeastern Arkansas. In 1915, local farmers began filing reports of a large, unknown creature off the banks of the White River. In July 1937, a key eyewitness account described the creature as having gray skin and being "as wide as a car and three cars long." A county deputy said the creature itself "looked like a large sturgeon or catfish." THE MONSTER RETURNS: The White River Monster was sighted again in the summer of 1971. That year, eyewitnesses who encountered the creature described it as "the size of a boxcar" with a bone protruding from its forehead. "It looked as if the thing was peeling all over, but it was a smooth type of skin or flesh," said one, and it made strange noises that sounded like a combination of a "cow's moo and a horse's neigh." Other accounts of the White River Monster described three-toed tracks, 14 inches in length, on Towhead Island leading down to the river through a path of bent trees and crushed bushes. Following the reports, in 1973 the Arkansas State Legislator created the White River Monster Refuge, making it illegal to "molest, kill, trample, or harm the White River Monster while he is in the retreat." MISTAKEN IDENTITY? According to scientists, the White River Monster is likely a case of mistaken identity. Cryptozoologist and biologist Roy P. Mackal has suggested that the creature is "a clear-cut instance of a known aquatic animal outside its normal habitat or range and therefore unidentified by the observers unfamiliar with the type." Mackal believes that the creature is in fact a large male elephant seal that wandered up the Mississippi River into White River. Measuring an average of 5,000 pounds and 14 feet in length, a male elephant seal shares many of the characteristics described by those who've encountered the "monster": gray skin, three-toed tracks, summer molting and a farm animal's call. Even the "bone" on the creature's forehead can be explained by the male elephant seal's inflatable trunk. So are male elephant seals visiting White River? No one's been able to confirm that they are, and the mystery continues.